Looking to raise funds for your school or organization? We can help and it's so easy! 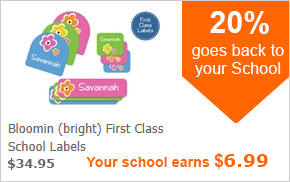 Parents need to label everything going to school, camp and daycare so why not make money from each sale for your school? It will shrink your Lost & Found pile too! Each time a parent purchases through your school's unique shopping link or enters your school's name at check out, your school receives a 20% commission. Yahoo! Why fundraise with Emily Press Labels? If you have any questions, please email us at fundraiser@emilypress.com or call 1-866-742-0777. It's so easy to get started! Just fill in the form below. * How did you hear about our Fundraisers?